Cannabis can be used effectively to help combat the symptoms of cancer. We discuss several strains that help fight pain, nausea and fatigue.Sometimes, it is a difficult task to find the weed best suited to your condition. For example, a person that is using medical marijuana to help boost their attention span will require weed that is very different than weed used to help ease cancer pain. We’re going to take a look at the best strains of weed to help combat different cancer related symptoms. Cancer is one of the most feared diseases in the entire world. The World Health Organization estimates that one out of every six deaths is caused by cancer, equating to 8.8 million global deaths in 2015. Though, fortunately, this number pales to the 32.6 million five-year survivors worldwide. Cancer is truly a condition that affects nearly everyone in some way. That’s a lot of people to leave grasping for more effective, natural treatments. This is why many turn to medical cannabis oil. But, does cannabis cure cancer? Here’s what you need to know about the illicit healing plant. A strain that is known to provide physical relief with a full body euphoria. Be careful when using the strain because it puts you into a tranquilized state where you are very tired and not motivated. Perhaps the most popular option to combat pain. This strain is perfect to reduce pain while not experiencing psychoactive effects. This is a strain that we recommend for anyone who wants to have a clear mind throughout the day. This strain reduces pain without the mental cloudiness that other strains offer. Many weed websites are dedicated to weed strains that help combat nausea. Why? Nausea is associated with many medications that help combat cancer, and nausea is also present after chemotherapy. Combating nausea is easy with Northern lights. This strain has a very sedative effect, but it combats nausea and relaxes the stomach. Providing the perfect balance between relaxation and nausea fighting. Blueberry diesel will settle the stomach and improve your mood. The ideal strain for anybody that needs to stay active but also wants to reduce nausea. Super lemon haze is described as providing an energetic cerebral high. Aromatic with a sweet taste, this strain boosts energy and improves your mood. Best described as euphoria finds energy. This strain boosts your energy levels greatly while providing the perfect level of euphoria for the smoker. This sativa strain enhances your sensory awareness while also boosting energy and allows you to remain focused. Sorry to disappoint, but there is no firm answer to this question. Thus far, there have been no randomized, human clinical trials to prove that cannabis oil, or any other cannabis treatment, cures cancer. Barriers to research have prevented scientists from testing the plant in cancer patients, meaning that there is no conclusive evidence that cannabis cures cancer or otherwise has some sort of impact. Preclinical research, however, shows that cannabis compounds effectively kill cancer cells in the lab. Anecdotal reports from patients using medical cannabis oil suggest that the herb is helpful in the disease as well. Rick Simpson, a well-known Canadian cannabis activist, is the face of the cannabis oil movement. After successfully treating his own skin cancer with cannabis oil, he created the documentary Run From The Cure to spread awareness and education about the amazing healing properties of cannabis. Since going public with his story, Simpson has inspired thousands of others to experiment with medical cannabis. Many of which, it would seem, have had some form of success. Humans have a long history with the cannabis plant. In fact, archeological evidence shows that the herb was used for cancer as early as 2,500 years ago. Back in 2014, researchers used MRI scans to diagnose breast cancer in the remains of a Siberian woman that had been preserved for over two millennia in ice. The woman, thought to be 25, was buried with a container of cannabis. Researchers suggest that she was using cannabis to manage the pain associated with breast cancer. While no one can say with certainty that cannabis does or does not cure cancer, it would seem that humans have been using the plant as a healing aid for generations. Did you know that cancer cells are immortal? For some reason, a rogue or damaged cell stops responding to the body’s normal immune signals. Normally, cells that are old, damaged or mutated in some way go through a process of programmed cell death. 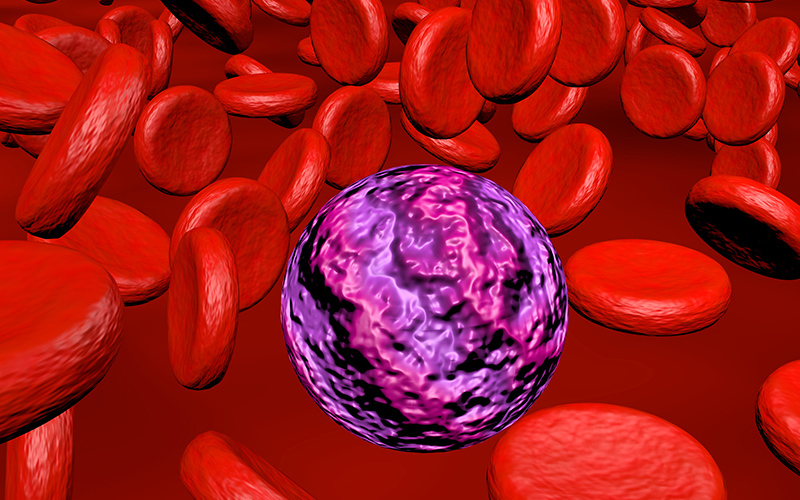 Programmed cell death should prevent mutated cells from growing and dividing. In cancer, however, this process stops. Research over the past two decades has uncovered that cannabinoids like tetrahydrocannabinol (THC) and cannabidiol (CBD) trigger programmed cell death in various types of cancer. THC is the primary psychoactive in the cannabis plant. CBD is one of the next most abundant cannabinoids and it is nonpsychoactive. THC causes the high, CBD helps calm things down. Specifically, cannabis compounds seem to induce a specific kind of programmed cell death called apoptosis, or cell suicide. Multiple studies have had similar findings, in both animal and cell line models. Another way cannabis compounds kill cancer cells is by halting proliferation. Because cancer cells cannot die on their own, the cells continue to grow and divide. These cells eventually create a tumor, which can interfere with vital bodily functions. Both THC and CBD have been found to have antiproliferative effects. Cannabinoid treatment has successfully halted the growth of tumors in both rodent and cellular models. Cannabis compounds not only halt the growth and division of cancer cells, but evidence shows that cannabinoids have anti-metastatic properties as well. A tumor becomes metastatic when cancer cells break off, travel through the bloodstream, and take up residence in different part of the body. Metastatic cancers are extremely difficult to treat. Research in both cellular and animal models has found that THC and CBD are anti-metastatic. This means that there is laboratory evidence that cannabis potentially prevents tumors from spreading to one site to another. If all of this is not surprising enough, cannabis treatments seem to kill cancer cells in one final way: starvation. In order for a tumor to grow, it needs to develop its own blood vessels to siphon nutrients and oxygen from the rest of the body. The process of developing blood vessels is called angiogenesis. Various preclinical cellular and animal studies suggest that both THC and CBD prevent tumors from developing blood vessels. This theoretically blocks the tumor from access to the nutrition that would otherwise keep it alive and prevents tumor growth. Does cannabis ease cancer symptoms? From a scientific perspective, no one can say that cannabis cures cancer quite yet. However, a growing number of patients are turning to the herb for cancer relief in one form or another. Some patients go as far as to assert that high doses of medical cannabis oil helped them fight their cancer and remain alive today. Yet, to be a bit more conservative, scientific evidence has yet to back up these claims. However, both anecdotal and scientific research do show that cannabinoid therapies can certainly ease symptoms of chemotherapy and help improve the quality of life for cancer patients. Already, cannabis-like prescription medications are available to cancer patients. Dronabinol and nabilone (Cesamet) are synthetic cannabinoids designed to mimic THC. These synthetics are prescribed for cancer-related nausea, vomiting, and lack of appetite. In Canada, patients with chemotherapy-related cancer pain can also access a cannabis-based drug called Sativex, which is an even blend of both THC and CBD.